Welcome to Cap-it Genuine Truckware. These terms and conditions outline the rules and regulations for the use of Cap-it Genuine Truckware’s Website. By accessing this website you expressly accept these terms and conditions in full. Do not continue to use Cap-it Genuine Truckware’s website if you do not accept all of the terms and conditions stated on this page. The following terminology applies to these Terms and Conditions, Privacy Statement and Disclaimer Notice and any or all Agreements: “Client”, “You” and “Your” refers to you, the person accessing this website and accepting the Company’s terms and conditions. “The Company”, “Ourselves”, “We”, “Our” and “Us”, refers to our Company. “Party”, “Parties”, or “Us”, refers to both the Client and ourselves, or either the Client or ourselves. All terms refer to the offer, acceptance and consideration of payment necessary (if applicable) to undertake the process of our assistance to the Client in the most appropriate manner, whether by formal meetings of a fixed duration, or any other means, for the express purpose of meeting the Client’s needs in respect of provision of the Company’s stated services/products, in accordance with and subject to, prevailing law of Canada. Any use of the above terminology or other words in the singular, plural, capitalization and/or he/she or they, are taken as interchangeable and therefore as referring to same. Redistribute content from Cap-it Genuine Truckware (unless content is specifically made for redistribution). Failure to do the above may violate applicable copyright, trademark or other intellectual property laws or other laws. Cap-it retains to its sole discretion to terminate or restrict your access to any component of https://cap-it.com/, in addition to any other rights or remedies available to Cap-it without any liability whatsoever. If you are among the organizations listed in paragraph 2 above and are interested in linking to our website, you must notify us by sending an e-mail to info@capitfranchise.com. Please include your name, your organization name and contact information (such as a phone number and/or e-mail address) as well as the URL of your site, a list of any URLs from which you intend to link to our Website, and a list of the URL(s) on our site to which you would like to link. Allow 2-3 weeks for a response. No use of Cap-it Genuine Truckware’s logo or other artwork will be allowed for linking absent a trademark license agreement. Cap-it Genuine Truckware has attempted to match online prices to those in store; however online prices, product and service selection and availability, and sale effective dates may differ from those in store and may vary by geographic region. Due to differences in sale effective dates across the country, items may be available online at the sale price before they are available in store. Stores are under no obligation to make promotional products available, or to match online prices until the sale begins in their region. Market conditions and competitive pressures may cause prices and availability to change without further notice. Cap-it stores may sell for less. Additionally, although great care is taken in the production of the https://cap-it.com/ Website, typographical, illustrative or pricing errors may occur. We reserve the right to correct errors at any time. For Gift Card purchases, prices quoted are payable in Canadian Dollars and, unless otherwise stated, do not include shipping charges. Please see Cap-it’s Shipping Policy for shipping and handling of Gift Card purchases. The e-fliers and https://cap-it.com/ each offer limited-time sales values, special buys and items at Cap-it Genuine Truckware. Regular prices shown are the prices at which the products have been sold by Cap-it Genuine Truckware as of the date of issuance indicated. All advertisements on the https://cap-it.com/ website are merely invitations for you to purchase goods or services from a Cap-it Genuine Truckware associate Store, and are not offers to sell by Cap-it Genuine Truckware. The products and services advertised in the e-Fiers are available at Cap-it Genuine Truckware Associate Stores in Canada. 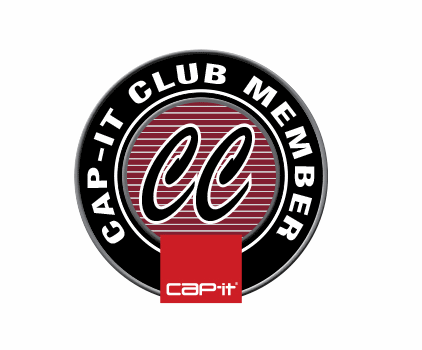 Cap-it Genuine Truckware Associate Stores are independently owned and operated by Cap-it International Inc.’s and/or Cap-it USA Inc.’s Franchisees. We shall have no responsibility or liability for any content appearing on our Website. You agree to indemnify and defend us against all claims arising out of or based upon usage of our Website. No link(s) to https://cap-it.com/ or any other of Cap-it Genuine Truckware’s websites may appear on any page on any website or within any context containing content or materials that may be interpreted as libelous, obscene or criminal, or which infringes, otherwise violates, or advocates the infringement or other violation of, any third party rights. Cap-it Genuine Truckware and the Third Parties are not responsible for late, lost, incomplete, illegible, misdirected or stolen messages or mail, unavailable network connections, failed, incomplete, garbled or delayed computer transmissions, on-line failures, hardware, software or other technical malfunctions or disturbances or any other communications failures or circumstances affecting, disrupting or corrupting communications. Cap-it Genuine Truckware and the Third Parties assume no responsibility, and shall not be liable for, any damages to, or any viruses affecting your computer equipment or other property on account of your access to, use of, or browsing on https://cap-it.com/ or your downloading of any materials, data, text, images, video or audio from https://cap-it.com/. In no event shall Cap-it Genuine Truckware or any of the Third Parties be liable for any injury, loss, claim, damage, or any special, exemplary, punitive, direct, indirect, incidental or consequential damages of any kind (including, but not limited to lost profits or lost savings), whether based in contract, tort, strict liability, or otherwise, which arises out of or is in any way connected with any use of https://cap-it.com/ or content found herein, the operation of the Website, or any failure or delay in the operation of the Website (including, but not limited to the inability to use any component of https://cap-it.com/ for purchases) even if advised of the possibility of damages. We use state-of-the-art Secure Socket Layer (SSL) encryption technology to protect your personal information. The only time you are required to sign on our site is when you are making a purchase. On the Checkout page, you will be asked to access your existing account or create a new one. Existing account holders are prompted for their ID (your email address) and password. This password is for your protection. If you don’t have your password, there is a link that reads “Lost your password?” Click on this for instructions on how to get your password. Only employees who require personal information to best serve our customers have access to your personal data. To ensure only necessary access, this data is password protected. All of our employees with access to this data are trained on our security policy and practices when they are hired. Periodically, these employees are given a refresher course to ensure security of this data. Our site is reviewed every two years for security. Has the security protocol changed? You can contact us by email at admin@cap-it.com.